The United States Declaration of Independence is the statement adopted by the Second Continental Congress meeting at the Pennsylvania State House (now known as Independence Hall) in Philadelphia, Pennsylvania, on July 4, 1776. The Declaration announced that the Thirteen Colonies at war with the Kingdom of Great Britain would regard themselves as thirteen independent sovereign states, no longer under British rule. With the Declaration, these new states took a collective first step toward forming the United States of America. The declaration was signed by representatives from New Hampshire, Massachusetts Bay, Rhode Island, Connecticut, New York, New Jersey, Pennsylvania, Maryland, Delaware, Virginia, North Carolina, South Carolina, and Georgia. The Lee Resolution for independence was passed on July 2 with no opposing votes. The Committee of Five had drafted the Declaration to be ready when Congress voted on independence. John Adams, a leader in pushing for independence, had persuaded the committee to select Thomas Jefferson to compose the original draft of the document, which Congress edited to produce the final version. The Declaration was a formal explanation of why Congress had voted to declare independence from Great Britain, more than a year after the outbreak of the American Revolutionary War. Adams wrote to his wife Abigail, "The Second Day of July 1776, will be the most memorable Epocha, in the History of America" – although Independence Day is actually celebrated on July 4, the date that the wording of the Declaration of Independence was approved. After ratifying the text on July 4, Congress issued the Declaration of Independence in several forms. It was initially published as the printed Dunlap broadside that was widely distributed and read to the public. The source copy used for this printing has been lost and may have been a copy in Thomas Jefferson's hand. Jefferson's original draft is preserved at the Library of Congress, complete with changes made by John Adams and Benjamin Franklin, as well as Jefferson's notes of changes made by Congress. The best-known version of the Declaration is a signed copy that is displayed at the National Archives in Washington, D.C., and which is popularly regarded as the official document. This engrossed copy (finalized, calligraphic copy) was ordered by Congress on July 19 and signed primarily on August 2. This has been called "one of the best-known sentences in the English language", containing "the most potent and consequential words in American history". The passage came to represent a moral standard to which the United States should strive. This view was notably promoted by Lincoln, who considered the Declaration to be the foundation of his political philosophy and argued that it is a statement of principles through which the United States Constitution should be interpreted. The Declaration of Independence inspired many similar documents in other countries, the first being the 1789 Declaration of United Belgian States issued during the Brabant Revolution in the Austrian Netherlands. It also served as the primary model for numerous declarations of independence in Europe and Latin America, as well as Africa (Liberia) and Oceania (New Zealand) during the first half of the 19th century. Believe me, dear Sir: there is not in the British empire a man who more cordially loves a union with Great Britain than I do. But, by the God that made me, I will cease to exist before I yield to a connection on such terms as the British Parliament propose; and in this, I think I speak the sentiments of America. By the time that the Declaration of Independence was adopted in July 1776, the Thirteen Colonies and Great Britain had been at war for more than a year. Relations had been deteriorating between the colonies and the mother country since 1763. Parliament enacted a series of measures to increase revenue from the colonies, such as the Stamp Act of 1765 and the Townshend Acts of 1767. Parliament believed that these acts were a legitimate means of having the colonies pay their fair share of the costs to keep them in the British Empire. Many colonists, however, had developed a different conception of the empire. The colonies were not directly represented in Parliament, and colonists argued that Parliament had no right to levy taxes upon them. This tax dispute was part of a larger divergence between British and American interpretations of the British Constitution and the extent of Parliament's authority in the colonies. The orthodox British view, dating from the Glorious Revolution of 1688, was that Parliament was the supreme authority throughout the empire, and so, by definition, anything that Parliament did was constitutional. In the colonies, however, the idea had developed that the British Constitution recognized certain fundamental rights that no government could violate, not even Parliament. After the Townshend Acts, some essayists even began to question whether Parliament had any legitimate jurisdiction in the colonies at all. Anticipating the arrangement of the British Commonwealth, by 1774 American writers such as Samuel Adams, James Wilson, and Thomas Jefferson were arguing that Parliament was the legislature of Great Britain only, and that the colonies, which had their own legislatures, were connected to the rest of the empire only through their allegiance to the Crown. The issue of Parliament's authority in the colonies became a crisis after Parliament passed the Coercive Acts (known as the Intolerable Acts in the colonies) in 1774 to punish the colonists for the Gaspee Affair of 1772 and the Boston Tea Party of 1773. Many colonists saw the Coercive Acts as a violation of the British Constitution and thus a threat to the liberties of all of British America, so the First Continental Congress convened in Philadelphia in September 1774 to coordinate a response. Congress organized a boycott of British goods and petitioned the king for repeal of the acts. These measures were unsuccessful because King George and the ministry of Prime Minister Lord North were determined to enforce parliamentary supremacy in America. As the king wrote to North in November 1774, "blows must decide whether they are to be subject to this country or independent". Most colonists still hoped for reconciliation with Great Britain, even after fighting began in the American Revolutionary War at Lexington and Concord in April 1775. The Second Continental Congress convened at the Pennsylvania State House in Philadelphia in May 1775, and some delegates hoped for eventual independence, but no one yet advocated declaring it. Many colonists no longer believed that Parliament had any sovereignty over them, yet they still professed loyalty to King George, who they hoped would intercede on their behalf. They were disappointed in late 1775 when the king rejected Congress's second petition, issued a Proclamation of Rebellion, and announced before Parliament on October 26 that he was considering "friendly offers of foreign assistance" to suppress the rebellion. A pro-American minority in Parliament warned that the government was driving the colonists toward independence. Thomas Paine's pamphlet Common Sense was published in January 1776, just as it became clear in the colonies that the king was not inclined to act as a conciliator. Paine had only recently arrived in the colonies from England, and he argued in favor of colonial independence, advocating republicanism as an alternative to monarchy and hereditary rule. Common Sense made a persuasive and impassioned case for independence, which had not yet been given serious intellectual consideration in the American colonies. Paine connected independence with Protestant beliefs as a means to present a distinctly American political identity, thereby stimulating public debate on a topic that few had previously dared to openly discuss, and public support for separation from Great Britain steadily increased after its publication. Some colonists still held out hope for reconciliation, but developments in early 1776 further strengthened public support for independence. In February 1776, colonists learned of Parliament's passage of the Prohibitory Act, which established a blockade of American ports and declared American ships to be enemy vessels. John Adams, a strong supporter of independence, believed that Parliament had effectively declared American independence before Congress had been able to. Adams labeled the Prohibitory Act the "Act of Independency", calling it "a compleat Dismemberment of the British Empire". Support for declaring independence grew even more when it was confirmed that King George had hired German mercenaries to use against his American subjects. Despite this growing popular support for independence, Congress lacked the clear authority to declare it. Delegates had been elected to Congress by 13 different governments, which included extralegal conventions, ad hoc committees, and elected assemblies, and they were bound by the instructions given to them. Regardless of their personal opinions, delegates could not vote to declare independence unless their instructions permitted such an action. Several colonies, in fact, expressly prohibited their delegates from taking any steps towards separation from Great Britain, while other delegations had instructions that were ambiguous on the issue; consequently, advocates of independence sought to have the Congressional instructions revised. For Congress to declare independence, a majority of delegations would need authorization to vote for it, and at least one colonial government would need to specifically instruct its delegation to propose a declaration of independence in Congress. Between April and July 1776, a "complex political war" was waged to bring this about. In the campaign to revise Congressional instructions, many Americans formally expressed their support for separation from Great Britain in what were effectively state and local declarations of independence. Historian Pauline Maier identifies more than ninety such declarations that were issued throughout the Thirteen Colonies from April to July 1776. These "declarations" took a variety of forms. Some were formal written instructions for Congressional delegations, such as the Halifax Resolves of April 12, with which North Carolina became the first colony to explicitly authorize its delegates to vote for independence. Others were legislative acts that officially ended British rule in individual colonies, such as the Rhode Island legislature declaring its independence from Great Britain on May 4, the first colony to do so. Many "declarations" were resolutions adopted at town or county meetings that offered support for independence. A few came in the form of jury instructions, such as the statement issued on April 23, 1776, by Chief Justice William Henry Drayton of South Carolina: "the law of the land authorizes me to declare ... that George the Third, King of Great Britain ... has no authority over us, and we owe no obedience to him." Most of these declarations are now obscure, having been overshadowed by the declaration approved by Congress on July 2, and signed July 4. Some colonies held back from endorsing independence. Resistance was centered in the middle colonies of New York, New Jersey, Maryland, Pennsylvania, and Delaware. Advocates of independence saw Pennsylvania as the key; if that colony could be converted to the pro-independence cause, it was believed that the others would follow. On May 1, however, opponents of independence retained control of the Pennsylvania Assembly in a special election that had focused on the question of independence. In response, Congress passed a resolution on May 10 which had been promoted by John Adams and Richard Henry Lee, calling on colonies without a "government sufficient to the exigencies of their affairs" to adopt new governments. The resolution passed unanimously, and was even supported by Pennsylvania's John Dickinson, the leader of the anti-independence faction in Congress, who believed that it did not apply to his colony. As was the custom, Congress appointed a committee to draft a preamble to explain the purpose of the resolution. John Adams wrote the preamble, which stated that because King George had rejected reconciliation and was hiring foreign mercenaries to use against the colonies, "it is necessary that the exercise of every kind of authority under the said crown should be totally suppressed". Adams's preamble was meant to encourage the overthrow of the governments of Pennsylvania and Maryland, which were still under proprietary governance. Congress passed the preamble on May 15 after several days of debate, but four of the middle colonies voted against it, and the Maryland delegation walked out in protest. Adams regarded his May 15 preamble effectively as an American declaration of independence, although a formal declaration would still have to be made. Lee's resolution met with resistance in the ensuing debate. Opponents of the resolution conceded that reconciliation was unlikely with Great Britain, while arguing that declaring independence was premature, and that securing foreign aid should take priority. Advocates of the resolution countered that foreign governments would not intervene in an internal British struggle, and so a formal declaration of independence was needed before foreign aid was possible. All Congress needed to do, they insisted, was to "declare a fact which already exists". Delegates from Pennsylvania, Delaware, New Jersey, Maryland, and New York were still not yet authorized to vote for independence, however, and some of them threatened to leave Congress if the resolution were adopted. Congress, therefore, voted on June 10 to postpone further discussion of Lee's resolution for three weeks. Until then, Congress decided that a committee should prepare a document announcing and explaining independence in the event that Lee's resolution was approved when it was brought up again in July. Support for a Congressional declaration of independence was consolidated in the final weeks of June 1776. On June 14, the Connecticut Assembly instructed its delegates to propose independence and, the following day, the legislatures of New Hampshire and Delaware authorized their delegates to declare independence. In Pennsylvania, political struggles ended with the dissolution of the colonial assembly, and a new Conference of Committees under Thomas McKean authorized Pennsylvania's delegates to declare independence on June 18. The Provincial Congress of New Jersey had been governing the province since January 1776; they resolved on June 15 that Royal Governor William Franklin was "an enemy to the liberties of this country" and had him arrested. On June 21, they chose new delegates to Congress and empowered them to join in a declaration of independence. Only Maryland and New York had yet to authorize independence towards the end of June. Previously, Maryland's delegates had walked out when the Continental Congress adopted Adams's radical May 15 preamble, and had sent to the Annapolis Convention for instructions. On May 20, the Annapolis Convention rejected Adams's preamble, instructing its delegates to remain against independence. But Samuel Chase went to Maryland and, thanks to local resolutions in favor of independence, was able to get the Annapolis Convention to change its mind on June 28. Only the New York delegates were unable to get revised instructions. When Congress had been considering the resolution of independence on June 8, the New York Provincial Congress told the delegates to wait. But on June 30, the Provincial Congress evacuated New York as British forces approached, and would not convene again until July 10. This meant that New York's delegates would not be authorized to declare independence until after Congress had made its decision. Political maneuvering was setting the stage for an official declaration of independence even while a document was being written to explain the decision. On June 11, 1776, Congress appointed a "Committee of Five" to draft a declaration, consisting of John Adams of Massachusetts, Benjamin Franklin of Pennsylvania, Thomas Jefferson of Virginia, Robert R. Livingston of New York, and Roger Sherman of Connecticut. The committee took no minutes, so there is some uncertainty about how the drafting process proceeded; contradictory accounts were written many years later by Jefferson and Adams, too many years to be regarded as entirely reliable—although their accounts are frequently cited. What is certain is that the committee discussed the general outline which the document should follow and decided that Jefferson would write the first draft. The committee in general, and Jefferson in particular, thought that Adams should write the document, but Adams persuaded them to choose Jefferson and promised to consult with him personally. Considering Congress's busy schedule, Jefferson probably had limited time for writing over the next 17 days, and he likely wrote the draft quickly. He then consulted the others and made some changes, and then produced another copy incorporating these alterations. The committee presented this copy to the Congress on June 28, 1776. The title of the document was "A Declaration by the Representatives of the United States of America, in General Congress assembled." Congress ordered that the draft "lie on the table" and then methodically edited Jefferson's primary document for the next two days, shortening it by a fourth, removing unnecessary wording, and improving sentence structure. They removed Jefferson's assertion that Great Britain had forced slavery on the colonies in order to moderate the document and appease persons in Great Britain who supported the Revolution. Jefferson wrote that Congress had "mangled" his draft version, but the Declaration that was finally produced was "the majestic document that inspired both contemporaries and posterity," in the words of his biographer John Ferling. Congress tabled the draft of the declaration on Monday, July 1 and resolved itself into a committee of the whole, with Benjamin Harrison of Virginia presiding, and they resumed debate on Lee's resolution of independence. John Dickinson made one last effort to delay the decision, arguing that Congress should not declare independence without first securing a foreign alliance and finalizing the Articles of Confederation. John Adams gave a speech in reply to Dickinson, restating the case for an immediate declaration. A vote was taken after a long day of speeches, each colony casting a single vote, as always. The delegation for each colony numbered from two to seven members, and each delegation voted amongst themselves to determine the colony's vote. Pennsylvania and South Carolina voted against declaring independence. The New York delegation abstained, lacking permission to vote for independence. Delaware cast no vote because the delegation was split between Thomas McKean, who voted yes, and George Read, who voted no. The remaining nine delegations voted in favor of independence, which meant that the resolution had been approved by the committee of the whole. The next step was for the resolution to be voted upon by Congress itself. Edward Rutledge of South Carolina was opposed to Lee's resolution but desirous of unanimity, and he moved that the vote be postponed until the following day. On July 2, South Carolina reversed its position and voted for independence. In the Pennsylvania delegation, Dickinson and Robert Morris abstained, allowing the delegation to vote three-to-two in favor of independence. The tie in the Delaware delegation was broken by the timely arrival of Caesar Rodney, who voted for independence. The New York delegation abstained once again since they were still not authorized to vote for independence, although they were allowed to do so a week later by the New York Provincial Congress. The resolution of independence was adopted with twelve affirmative votes and one abstention, and the colonies officially severed political ties with Great Britain. John Adams wrote to his wife on the following day and predicted that July 2 would become a great American holiday He thought that the vote for independence would be commemorated; he did not foresee that Americans would instead celebrate Independence Day on the date when the announcement of that act was finalized. I am apt to believe that [Independence Day] will be celebrated, by succeeding Generations, as the great anniversary Festival. It ought to be commemorated, as the Day of Deliverance by solemn Acts of Devotion to God Almighty. It ought to be solemnized with Pomp and Parade, with shews, Games, Sports, Guns, Bells, Bonfires and Illuminations from one End of this Continent to the other from this Time forward forever more. Congress next turned its attention to the committee's draft of the declaration. They made a few changes in wording during several days of debate and deleted nearly a fourth of the text. The wording of the Declaration of Independence was approved on July 4, 1776 and sent to the printer for publication. The opening of the original printing of the Declaration, printed on July 4, 1776 under Jefferson's supervision. The engrossed copy was made later (shown at the top of this article). Note that the opening lines differ between the two versions. Independence amounted to a new status of interdependence: the United States was now a sovereign nation entitled to the privileges and responsibilities that came with that status. America thus became a member of the international community, which meant becoming a maker of treaties and alliances, a military ally in diplomacy, and a partner in foreign trade on a more equal basis. The declaration is not divided into formal sections; but it is often discussed as consisting of five parts: introduction, preamble, indictment of King George III, denunciation of the British people, and conclusion. Asserts as a matter of Natural Law the ability of a people to assume political independence; acknowledges that the grounds for such independence must be reasonable, and therefore explicable, and ought to be explained. Outlines a general philosophy of government that justifies revolution when government harms natural rights. "We hold these truths to be self-evident, that all men are created equal, that they are endowed by their Creator with certain unalienable Rights, that among these are Life, Liberty and the pursuit of Happiness. "That to secure these rights, Governments are instituted among Men, deriving their just powers from the consent of the governed, That whenever any Form of Government becomes destructive of these ends, it is the Right of the People to alter or to abolish it, and to institute new Government, laying its foundation on such principles and organizing its powers in such form, as to them shall seem most likely to effect their Safety and Happiness. Prudence, indeed, will dictate that Governments long established should not be changed for light and transient causes; and accordingly all experience hath shewn, that mankind are more disposed to suffer, while evils are sufferable, than to right themselves by abolishing the forms to which they are accustomed. But when a long train of abuses and usurpations, pursuing invariably the same Object evinces a design to reduce them under absolute Despotism, it is their right, it is their duty, to throw off such Government, and to provide new Guards for their future security." A bill of particulars documenting the king's "repeated injuries and usurpations" of the Americans' rights and liberties. "Such has been the patient sufferance of these Colonies; and such is now the necessity which constrains them to alter their former Systems of Government. The history of the present King of Great Britain is a history of repeated injuries and usurpations, all having in direct object the establishment of an absolute Tyranny over these States. To prove this, let Facts be submitted to a candid world. "He has refused his Assent to Laws, the most wholesome and necessary for the public good. "He has forbidden his Governors to pass Laws of immediate and pressing importance, unless suspended in their operation till his Assent should be obtained; and when so suspended, he has utterly neglected to attend to them. "He has refused to pass other Laws for the accommodation of large districts of people, unless those people would relinquish the right of Representation in the Legislature, a right inestimable to them and formidable to tyrants only. "He has called together legislative bodies at places unusual, uncomfortable, and distant from the depository of their Public Records, for the sole purpose of fatiguing them into compliance with his measures. "He has dissolved Representative Houses repeatedly, for opposing with manly firmness of his invasions on the rights of the people. "He has refused for a long time, after such dissolutions, to cause others to be elected, whereby the Legislative Powers, incapable of Annihilation, have returned to the People at large for their exercise; the State remaining in the meantime exposed to all the dangers of invasion from without, and convulsions within. "He has endeavoured to prevent the population of these States; for that purpose obstructing the Laws for Naturalization of Foreigners; refusing to pass others to encourage their migrations hither, and raising the conditions of new Appropriations of Lands. "He has obstructed the Administration of Justice by refusing his Assent to Laws for establishing Judiciary Powers. "He has made Judges dependent on his Will alone for the tenure of their offices, and the amount and payment of their salaries. "He has erected a multitude of New Offices, and sent hither swarms of Officers to harass our people and eat out their substance. "He has kept among us, in times of peace, Standing Armies without the Consent of our legislatures. "He has affected to render the Military independent of and superior to the Civil Power. "For suspending our own Legislatures, and declaring themselves invested with power to legislate for us in all cases whatsoever. "He has abdicated Government here, by declaring us out of his Protection and waging War against us. "He has plundered our seas, ravaged our coasts, burnt our towns, and destroyed the lives of our people. "He is at this time transporting large Armies of foreign Mercenaries to compleat the works of death, desolation, and tyranny, already begun with circumstances of Cruelty & Perfidy scarcely paralleled in the most barbarous ages, and totally unworthy the Head of a civilized nation. "He has constrained our fellow Citizens taken Captive on the high Seas to bear Arms against their Country, to become the executioners of their friends and Brethren, or to fall themselves by their Hands. "He has excited domestic insurrections amongst us, and has endeavoured to bring on the inhabitants of our frontiers, the merciless Indian Savages whose known rule of warfare, is an undistinguished destruction of all ages, sexes and conditions. "In every stage of these Oppressions We have Petitioned for Redress in the most humble terms: Our repeated Petitions have been answered only by repeated injury. A Prince, whose character is thus marked by every act which may define a Tyrant, is unfit to be the ruler of a free people." This section essentially finishes the case for independence. The conditions that justified revolution have been shown. "Nor have We been wanting in attentions to our British brethren. We have warned them from time to time of attempts by their legislature to extend an unwarrantable jurisdiction over us. We have reminded them of the circumstances of our emigration and settlement here. We have appealed to their native justice and magnanimity, and we have conjured them by the ties of our common kindred to disavow these usurpations, which, would inevitably interrupt our connections and correspondence. They too have been deaf to the voice of justice and of consanguinity. We must, therefore, acquiesce in the necessity, which denounces our Separation, and hold them, as we hold the rest of mankind, Enemies in War, in Peace Friends." The signers assert that there exist conditions under which people must change their government, that the British have produced such conditions and, by necessity, the colonies must throw off political ties with the British Crown and become independent states. The conclusion contains, at its core, the Lee Resolution that had been passed on July 2. "We, therefore, the Representatives of the united States of America, in General Congress, Assembled, appealing to the Supreme Judge of the world for the rectitude of our intentions, do, in the Name, and by Authority of the good People of these Colonies, solemnly publish and declare, That these united Colonies are, and of Right ought to be Free and Independent States; that they are Absolved from all Allegiance to the British Crown, and that all political connection between them and the State of Great Britain, is and ought to be totally dissolved; and that as Free and Independent States, they have full Power to levy War, conclude Peace, contract Alliances, establish Commerce, and to do all other Acts and Things which Independent States may of right do. And for the support of this Declaration, with a firm reliance on the protection of divine Providence, we mutually pledge to each other our Lives, our Fortunes and our sacred Honor." Neither aiming at originality of principle or sentiment, nor yet copied from any particular and previous writing, it was intended to be an expression of the American mind, and to give to that expression the proper tone and spirit called for by the occasion. Jefferson's most immediate sources were two documents written in June 1776: his own draft of the preamble of the Constitution of Virginia, and George Mason's draft of the Virginia Declaration of Rights. Ideas and phrases from both of these documents appear in the Declaration of Independence. They were, in turn, directly influenced by the 1689 English Declaration of Rights, which formally ended the reign of King James II. During the American Revolution, Jefferson and other Americans looked to the English Declaration of Rights as a model of how to end the reign of an unjust king. The Scottish Declaration of Arbroath (1320) and the Dutch Act of Abjuration (1581) have also been offered as models for Jefferson's Declaration, but these models are now accepted by few scholars. 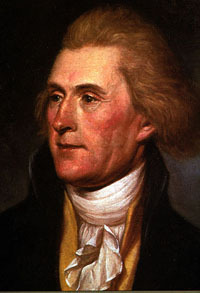 Jefferson wrote that a number of authors exerted a general influence on the words of the Declaration. English political theorist John Locke is usually cited as one of the primary influences, a man whom Jefferson called one of "the three greatest men that have ever lived". In 1922, historian Carl L. Becker wrote, "Most Americans had absorbed Locke's works as a kind of political gospel; and the Declaration, in its form, in its phraseology, follows closely certain sentences in Locke's second treatise on government." The extent of Locke's influence on the American Revolution has been questioned by some subsequent scholars, however. Historian Ray Forrest Harvey argued in 1937 for the dominant influence of Swiss jurist Jean Jacques Burlamaqui, declaring that Jefferson and Locke were at "two opposite poles" in their political philosophy, as evidenced by Jefferson's use in the Declaration of Independence of the phrase "pursuit of happiness" instead of "property". Other scholars emphasized the influence of republicanism rather than Locke's classical liberalism. Historian Garry Wills argued that Jefferson was influenced by the Scottish Enlightenment, particularly Francis Hutcheson, rather than Locke, an interpretation that has been strongly criticized. Legal historian John Phillip Reid has written that the emphasis on the political philosophy of the Declaration has been misplaced. The Declaration is not a philosophical tract about natural rights, argues Reid, but is instead a legal document—an indictment against King George for violating the constitutional rights of the colonists. As such, it follows the process of the 1550 Magdeburg Confession, which legitimized resistance against Holy Roman Emperor Charles V in a multi-step legal formula now known as the doctrine of the Lesser magistrate. Historian David Armitage has argued that the Declaration was strongly influenced by de Vattel's The Law of Nations, the dominant international law treatise of the period, and a book that Benjamin Franklin said was "continually in the hands of the members of our Congress". Armitage writes, "Vattel made independence fundamental to his definition of statehood"; therefore, the primary purpose of the Declaration was "to express the international legal sovereignty of the United States". If the United States were to have any hope of being recognized by the European powers, the American revolutionaries first had to make it clear that they were no longer dependent on Great Britain. The Declaration of Independence does not have the force of law domestically, but nevertheless it may help to provide historical and legal clarity about the Constitution and other laws. The signed copy of the Declaration is now badly faded because of poor preserving practices in the 19th century. It is on display at the National Archives in Washington, D.C. 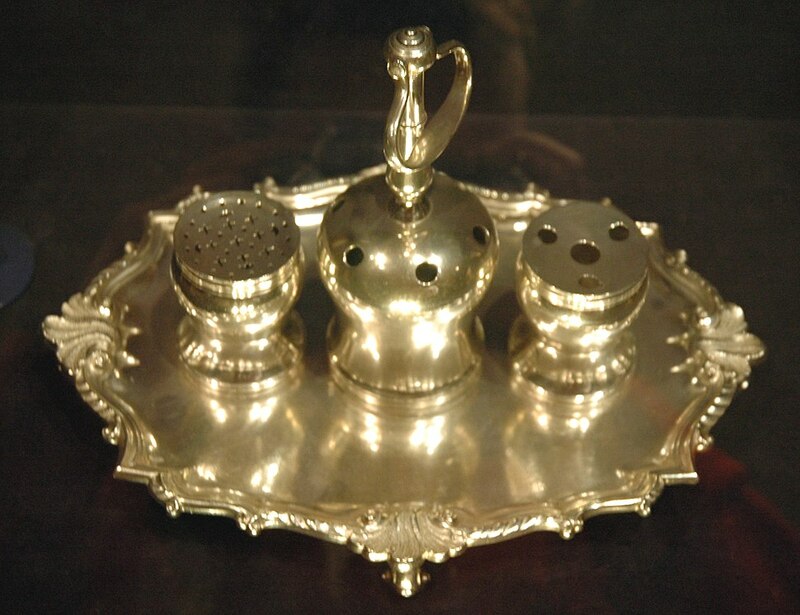 The Syng inkstand was used at both the signing of the Declaration and the 1787 signing of the U.S. Constitution. The Declaration became official when Congress voted for it on July 4; signatures of the delegates were not needed to make it official. The handwritten copy of the Declaration of Independence that was signed by Congress is dated July 4, 1776. The signatures of fifty-six delegates are affixed; however, the exact date when each person signed it has long been the subject of debate. Jefferson, Franklin, and Adams all wrote that the Declaration had been signed by Congress on July 4. But in 1796, signer Thomas McKean disputed that the Declaration had been signed on July 4, pointing out that some signers were not then present, including several who were not even elected to Congress until after that date. The Declaration was transposed on paper, adopted by the Continental Congress, and signed by John Hancock, President of the Congress, on July 4, 1776, according to the 1911 record of events by the U.S. State Department under Secretary Philander C. Knox. On August 2, 1776, a parchment paper copy of the Declaration was signed by 56 persons. Many of these signers were not present when the original Declaration was adopted on July 4. Signer Matthew Thornton from New Hampshire was seated in the Continental Congress in November; he asked for and received the privilege of adding his signature at that time, and signed on November 4, 1776. On July 4, 1776, Continental Congress President John Hancock's signature authenticated the United States Declaration of Independence. Historians have generally accepted McKean's version of events, arguing that the famous signed version of the Declaration was created after July 19, and was not signed by Congress until August 2, 1776. In 1986, legal historian Wilfred Ritz argued that historians had misunderstood the primary documents and given too much credence to McKean, who had not been present in Congress on July 4. According to Ritz, about thirty-four delegates signed the Declaration on July 4, and the others signed on or after August 2. Historians who reject a July 4 signing maintain that most delegates signed on August 2, and that those eventual signers who were not present added their names later. Two future U.S. presidents were among the signatories: Thomas Jefferson and John Adams. The most famous signature on the engrossed copy is that of John Hancock, who presumably signed first as President of Congress. Hancock's large, flamboyant signature became iconic, and the term John Hancock emerged in the United States as an informal synonym for "signature". A commonly circulated but apocryphal account claims that, after Hancock signed, the delegate from Massachusetts commented, "The British ministry can read that name without spectacles." Another apocryphal report indicates that Hancock proudly declared, "There! I guess King George will be able to read that!" Various legends emerged years later about the signing of the Declaration, when the document had become an important national symbol. In one famous story, John Hancock supposedly said that Congress, having signed the Declaration, must now "all hang together", and Benjamin Franklin replied: "Yes, we must indeed all hang together, or most assuredly we shall all hang separately." The quotation did not appear in print until more than fifty years after Franklin's death. The Syng inkstand used at the signing was also used at the signing of the United States Constitution in 1787. Johannes Adam Simon Oertel's painting Pulling Down the Statue of King George III, N.Y.C., ca. 1859, depicts citizens destroying a statue of King George after the Declaration was read in New York City on July 9, 1776. After Congress approved the final wording of the Declaration on July 4, a handwritten copy was sent a few blocks away to the printing shop of John Dunlap. Through the night, Dunlap printed about 200 broadsides for distribution. Before long, it was being read to audiences and reprinted in newspapers throughout the 13 states. The first formal public readings of the document took place on July 8, in Philadelphia (by John Nixon in the yard of Independence Hall), Trenton, New Jersey, and Easton, Pennsylvania; the first newspaper to publish it was the Pennsylvania Evening Post on July 6. A German translation of the Declaration was published in Philadelphia by July 9. President of Congress John Hancock sent a broadside to General George Washington, instructing him to have it proclaimed "at the Head of the Army in the way you shall think it most proper". Washington had the Declaration read to his troops in New York City on July 9, with thousands of British troops on ships in the harbor. Washington and Congress hoped that the Declaration would inspire the soldiers, and encourage others to join the army. After hearing the Declaration, crowds in many cities tore down and destroyed signs or statues representing royal authority. An equestrian statue of King George in New York City was pulled down and the lead used to make musket balls. William Whipple, signer of the Declaration of Independence, freed his slave believing that he could not both fight for liberty and own a slave. British officials in North America sent copies of the Declaration to Great Britain. It was published in British newspapers beginning in mid-August, it had reached Florence and Warsaw by mid-September, and a German translation appeared in Switzerland by October. The first copy of the Declaration sent to France got lost, and the second copy arrived only in November 1776. It reached Portuguese America by Brazilian medical student "Vendek" José Joaquim Maia e Barbalho, who had met with Thomas Jefferson in Nîmes. The Spanish-American authorities banned the circulation of the Declaration, but it was widely transmitted and translated: by Venezuelan Manuel García de Sena, by Colombian Miguel de Pombo, by Ecuadorian Vicente Rocafuerte, and by New Englanders Richard Cleveland and William Shaler, who distributed the Declaration and the United States Constitution among Creoles in Chile and Indians in Mexico in 1821. The North Ministry did not give an official answer to the Declaration, but instead secretly commissioned pamphleteer John Lind to publish a response entitled Answer to the Declaration of the American Congress. British Tories denounced the signers of the Declaration for not applying the same principles of "life, liberty, and the pursuit of happiness" to African Americans. Thomas Hutchinson, the former royal governor of Massachusetts, also published a rebuttal. These pamphlets challenged various aspects of the Declaration. Hutchinson argued that the American Revolution was the work of a few conspirators who wanted independence from the outset, and who had finally achieved it by inducing otherwise loyal colonists to rebel. Lind's pamphlet had an anonymous attack on the concept of natural rights written by Jeremy Bentham, an argument that he repeated during the French Revolution. Both pamphlets asked how the American slaveholders in Congress could proclaim that "all men are created equal" without freeing their own slaves. William Whipple, a signer of the Declaration of Independence who had fought in the war, freed his slave Prince Whipple because of revolutionary ideals. In the postwar decades, other slaveholders also freed their slaves; from 1790 to 1810, the percentage of free blacks in the Upper South increased to 8.3 percent from less than one percent of the black population. All Northern states abolished slavery by 1804. The official copy of the Declaration of Independence was the one printed on July 4, 1776, under Jefferson's supervision. It was sent to the states and to the Army and was widely reprinted in newspapers. The slightly different "engrossed copy" (shown at the top of this article) was made later for members to sign. The engrossed version is the one widely distributed in the 21st century. Note that the opening lines differ between the two versions. The copy of the Declaration that was signed by Congress is known as the engrossed or parchment copy. It was probably engrossed (that is, carefully handwritten) by clerk Timothy Matlack. A facsimile made in 1823 has become the basis of most modern reproductions rather than the original because of poor conservation of the engrossed copy through the 19th century. In 1921, custody of the engrossed copy of the Declaration was transferred from the State Department to the Library of Congress, along with the United States Constitution. After the Japanese attack on Pearl Harbor in 1941, the documents were moved for safekeeping to the United States Bullion Depository at Fort Knox in Kentucky, where they were kept until 1944. In 1952, the engrossed Declaration was transferred to the National Archives and is now on permanent display at the National Archives in the "Rotunda for the Charters of Freedom". The document signed by Congress and enshrined in the National Archives is usually regarded as the Declaration of Independence, but historian Julian P. Boyd argued that the Declaration, like Magna Carta, is not a single document. Boyd considered the printed broadsides ordered by Congress to be official texts, as well. The Declaration was first published as a broadside that was printed the night of July 4 by John Dunlap of Philadelphia. Dunlap printed about 200 broadsides, of which 26 are known to survive. The 26th copy was discovered in The National Archives in England in 2009. In 1777, Congress commissioned Mary Katherine Goddard to print a new broadside that listed the signers of the Declaration, unlike the Dunlap broadside. Nine copies of the Goddard broadside are known to still exist. A variety of broadsides printed by the states are also extant. Several early handwritten copies and drafts of the Declaration have also been preserved. Jefferson kept a four-page draft that late in life he called the "original Rough draught". It is not known how many drafts Jefferson wrote prior to this one, and how much of the text was contributed by other committee members. In 1947, Boyd discovered a fragment of an earlier draft in Jefferson's handwriting. Jefferson and Adams sent copies of the rough draft to friends, with slight variations. During the writing process, Jefferson showed the rough draft to Adams and Franklin, and perhaps to other members of the drafting committee, who made a few more changes. Franklin, for example, may have been responsible for changing Jefferson's original phrase "We hold these truths to be sacred and undeniable" to "We hold these truths to be self-evident". Jefferson incorporated these changes into a copy that was submitted to Congress in the name of the committee. The copy that was submitted to Congress on June 28 has been lost and was perhaps destroyed in the printing process, or destroyed during the debates in accordance with Congress's secrecy rule. On April 21, 2017, it was announced that a second engrossed copy had been discovered in the archives at West Sussex County Council in Chichester, England. Named by its finders the "Sussex Declaration", it differs from the National Archives copy (which the finders refer to as the "Matlack Declaration") in that the signatures on it are not grouped by States. How it came to be in England is not yet known, but the finders believe that the randomness of the signatures points to an origin with signatory James Wilson, who had argued strongly that the Declaration was made not by the States but by the whole people. The Declaration was given little attention in the years immediately following the American Revolution, having served its original purpose in announcing the independence of the United States. Early celebrations of Independence Day largely ignored the Declaration, as did early histories of the Revolution. The act of declaring independence was considered important, whereas the text announcing that act attracted little attention. The Declaration was rarely mentioned during the debates about the United States Constitution, and its language was not incorporated into that document. George Mason's draft of the Virginia Declaration of Rights was more influential, and its language was echoed in state constitutions and state bills of rights more often than Jefferson's words. "In none of these documents", wrote Pauline Maier, "is there any evidence whatsoever that the Declaration of Independence lived in men's minds as a classic statement of American political principles." Many leaders of the French Revolution admired the Declaration of Independence but were also interested in the new American state constitutions. The inspiration and content of the French Declaration of the Rights of Man and Citizen (1789) emerged largely from the ideals of the American Revolution. Its key drafts were prepared by Lafayette, working closely in Paris with his friend Thomas Jefferson. It also borrowed language from George Mason's Virginia Declaration of Rights. The declaration also influenced the Russian Empire. The document had a particular impact on the Decembrist revolt and other Russian thinkers. According to historian David Armitage, the Declaration of Independence did prove to be internationally influential, but not as a statement of human rights. Armitage argued that the Declaration was the first in a new genre of declarations of independence that announced the creation of new states. Other French leaders were directly influenced by the text of the Declaration of Independence itself. The Manifesto of the Province of Flanders (1790) was the first foreign derivation of the Declaration; others include the Venezuelan Declaration of Independence (1811), the Liberian Declaration of Independence (1847), the declarations of secession by the Confederate States of America (1860–61), and the Vietnamese Proclamation of Independence (1945). These declarations echoed the United States Declaration of Independence in announcing the independence of a new state, without necessarily endorsing the political philosophy of the original. Other countries have used the Declaration as inspiration or have directly copied sections from it. These include the Haitian declaration of January 1, 1804, during the Haitian Revolution, the United Provinces of New Granada in 1811, the Argentine Declaration of Independence in 1816, the Chilean Declaration of Independence in 1818, Costa Rica in 1821, El Salvador in 1821, Guatemala in 1821, Honduras in (1821), Mexico in 1821, Nicaragua in 1821, Peru in 1821, Bolivian War of Independence in 1825, Uruguay in 1825, Ecuador in 1830, Colombia in 1831, Paraguay in 1842, Dominican Republic in 1844, Texas Declaration of Independence in March 1836, California Republic in November 1836, Hungarian Declaration of Independence in 1849, Declaration of the Independence of New Zealand in 1835, and the Czechoslovak declaration of independence from 1918 drafted in Washington D.C. with Gutzon Borglum among the drafters. The Rhodesian declaration of independence, ratified in November 1965, is based on the American one as well; however, it omits the phrases "all men are created equal" and "the consent of the governed". The South Carolina declaration of secession from December 1860 also mentions the U.S. Declaration of Independence, though it, like the Rhodesian one, omits references to "all men are created equal" and "consent of the governed". Interest in the Declaration was revived in the 1790s with the emergence of the United States's first political parties. Throughout the 1780s, few Americans knew or cared who wrote the Declaration. But in the next decade, Jeffersonian Republicans sought political advantage over their rival Federalists by promoting both the importance of the Declaration and Jefferson as its author. Federalists responded by casting doubt on Jefferson's authorship or originality, and by emphasizing that independence was declared by the whole Congress, with Jefferson as just one member of the drafting committee. Federalists insisted that Congress's act of declaring independence, in which Federalist John Adams had played a major role, was more important than the document announcing it. But this view faded away, like the Federalist Party itself, and, before long, the act of declaring independence became synonymous with the document. A less partisan appreciation for the Declaration emerged in the years following the War of 1812, thanks to a growing American nationalism and a renewed interest in the history of the Revolution. In 1817, Congress commissioned John Trumbull's famous painting of the signers, which was exhibited to large crowds before being installed in the Capitol. The earliest commemorative printings of the Declaration also appeared at this time, offering many Americans their first view of the signed document. Collective biographies of the signers were first published in the 1820s, giving birth to what Garry Wills called the "cult of the signers". In the years that followed, many stories about the writing and signing of the document were published for the first time. When interest in the Declaration was revived, the sections that were most important in 1776 were no longer relevant: the announcement of the independence of the United States and the grievances against King George. But the second paragraph was applicable long after the war had ended, with its talk of self-evident truths and unalienable rights. The Constitution and the Bill of Rights lacked sweeping statements about rights and equality, and advocates of groups with grievances turned to the Declaration for support. Starting in the 1820s, variations of the Declaration were issued to proclaim the rights of workers, farmers, women, and others. In 1848, for example, the Seneca Falls Convention of women's rights advocates declared that "all men and women are created equal". John Trumbull's famous painting is often identified as a depiction of the signing of the Declaration, but it actually shows the drafting committee presenting its work to the Congress. John Trumbull's painting Declaration of Independence has played a significant role in popular conceptions of the Declaration of Independence. The painting is 12-by-18-foot (3.7 by 5.5 m) in size and was commissioned by the United States Congress in 1817; it has hung in the United States Capitol Rotunda since 1826. It is sometimes described as the signing of the Declaration of Independence, but it actually shows the Committee of Five presenting their draft of the Declaration to the Second Continental Congress on June 28, 1776, and not the signing of the document, which took place later. Trumbull painted the figures from life whenever possible, but some had died and images could not be located; hence, the painting does not include all the signers of the Declaration. One figure had participated in the drafting but did not sign the final document; another refused to sign. In fact, the membership of the Second Continental Congress changed as time passed, and the figures in the painting were never in the same room at the same time. It is, however, an accurate depiction of the room in Independence Hall, the centerpiece of the Independence National Historical Park in Philadelphia, Pennsylvania. Trumbull's painting has been depicted multiple times on U.S. currency and postage stamps. Its first use was on the reverse side of the $100 National Bank Note issued in 1863. A few years later, the steel engraving used in printing the bank notes was used to produce a 24-cent stamp, issued as part of the 1869 Pictorial Issue. An engraving of the signing scene has been featured on the reverse side of the United States two-dollar bill since 1976. The apparent contradiction between the claim that "all men are created equal" and the existence of American slavery attracted comment when the Declaration was first published. As mentioned above, Jefferson had included a paragraph in his initial draft that strongly indicted Great Britain's role in the slave trade, but this was deleted from the final version. Jefferson himself was a prominent Virginia slave holder, having owned hundreds of slaves. Referring to this seeming contradiction, English abolitionist Thomas Day wrote in a 1776 letter, "If there be an object truly ridiculous in nature, it is an American patriot, signing resolutions of independency with the one hand, and with the other brandishing a whip over his affrighted slaves." In the 19th century, the Declaration took on a special significance for the abolitionist movement. Historian Bertram Wyatt-Brown wrote that "abolitionists tended to interpret the Declaration of Independence as a theological as well as a political document". Abolitionist leaders Benjamin Lundy and William Lloyd Garrison adopted the "twin rocks" of "the Bible and the Declaration of Independence" as the basis for their philosophies. "As long as there remains a single copy of the Declaration of Independence, or of the Bible, in our land," wrote Garrison, "we will not despair." For radical abolitionists such as Garrison, the most important part of the Declaration was its assertion of the right of revolution. Garrison called for the destruction of the government under the Constitution, and the creation of a new state dedicated to the principles of the Declaration. The controversial question of whether to add additional slave states to the United States coincided with the growing stature of the Declaration. The first major public debate about slavery and the Declaration took place during the Missouri controversy of 1819 to 1821. Antislavery Congressmen argued that the language of the Declaration indicated that the Founding Fathers of the United States had been opposed to slavery in principle, and so new slave states should not be added to the country. Proslavery Congressmen led by Senator Nathaniel Macon of North Carolina argued that the Declaration was not a part of the Constitution and therefore had no relevance to the question. With the antislavery movement gaining momentum, defenders of slavery such as John Randolph and John C. Calhoun found it necessary to argue that the Declaration's assertion that "all men are created equal" was false, or at least that it did not apply to black people. During the debate over the Kansas–Nebraska Act in 1853, for example, Senator John Pettit of Indiana argued that the statement "all men are created equal" was not a "self-evident truth" but a "self-evident lie". Opponents of the Kansas–Nebraska Act, including Salmon P. Chase and Benjamin Wade, defended the Declaration and what they saw as its antislavery principles. Nearly eighty years ago we began by declaring that all men are created equal; but now from that beginning we have run down to the other declaration, that for some men to enslave others is a "sacred right of self-government". ... Our republican robe is soiled and trailed in the dust. ... Let us repurify it. Let us re-adopt the Declaration of Independence, and with it, the practices, and policy, which harmonize with it. ... If we do this, we shall not only have saved the Union: but we shall have saved it, as to make, and keep it, forever worthy of the saving. I think the authors of that notable instrument intended to include all men, but they did not mean to declare all men equal in all respects. They did not mean to say all men were equal in color, size, intellect, moral development, or social capacity. They defined with tolerable distinctness in what they did consider all men created equal—equal in "certain inalienable rights, among which are life, liberty, and the pursuit of happiness." This they said, and this they meant. They did not mean to assert the obvious untruth that all were then actually enjoying that equality, or yet that they were about to confer it immediately upon them. In fact, they had no power to confer such a boon. They meant simply to declare the right, so that the enforcement of it might follow as fast as circumstances should permit. They meant to set up a standard maxim for free society which should be familiar to all, constantly looked to, constantly labored for, and even, though never perfectly attained, constantly approximated, and thereby constantly spreading and deepening its influence, and augmenting the happiness and value of life to all people, of all colors, everywhere. According to Pauline Maier, Douglas's interpretation was more historically accurate, but Lincoln's view ultimately prevailed. "In Lincoln's hands," wrote Maier, "the Declaration of Independence became first and foremost a living document" with "a set of goals to be realized over time". Like Daniel Webster, James Wilson, and Joseph Story before him, Lincoln argued that the Declaration of Independence was a founding document of the United States, and that this had important implications for interpreting the Constitution, which had been ratified more than a decade after the Declaration. The Constitution did not use the word "equality", yet Lincoln believed that the concept that "all men are created equal" remained a part of the nation's founding principles. He famously expressed this belief in the opening sentence of his 1863 Gettysburg Address: "Four score and seven years ago [i.e. in 1776] our fathers brought forth on this continent, a new nation, conceived in Liberty, and dedicated to the proposition that all men are created equal." Lincoln's view of the Declaration became influential, seeing it as a moral guide to interpreting the Constitution. "For most people now," wrote Garry Wills in 1992, "the Declaration means what Lincoln told us it means, as a way of correcting the Constitution itself without overthrowing it." Admirers of Lincoln such as Harry V. Jaffa praised this development. Critics of Lincoln, notably Willmoore Kendall and Mel Bradford, argued that Lincoln dangerously expanded the scope of the national government and violated states' rights by reading the Declaration into the Constitution. Elizabeth Cady Stanton and her two sons (1848). In July 1848, the first woman's rights convention, the Seneca Falls Convention, was held in Seneca Falls, New York. The convention was organized by Elizabeth Cady Stanton, Lucretia Mott, Mary Ann McClintock, and Jane Hunt. In their "Declaration of Sentiments", patterned on the Declaration of Independence, the convention members demanded social and political equality for women. Their motto was that "All men and women are created equal" and the convention demanded suffrage for women. The suffrage movement was supported by William Lloyd Garrison and Frederick Douglass. The Declaration was chosen to be the first digitized text (1971). The Memorial to the 56 Signers of the Declaration of Independence was dedicated in 1984 in Constitution Gardens on the National Mall in Washington, D.C., where the signatures of all the original signers are carved in stone with their names, places of residence, and occupations. The new One World Trade Center building in New York City (2014) is 1776 feet high to symbolize the year that the Declaration of Independence was signed. The adoption of the Declaration of Independence was dramatized in the 1969 Tony Award–winning musical 1776 and the 1972 film version, as well as in the 2008 television miniseries John Adams. In 1970, The 5th Dimension recorded the opening of the Declaration on their album Portrait in the song "Declaration". It was first performed on the Ed Sullivan Show on December 7, 1969, and it was taken as a song of protest against the Vietnam War. The Declaration of Independence is also a plot device in the 2004 American film National Treasure. ^ a b "Declaring Independence", Revolutionary War, Digital History, University of Houston. From Adams' notes: "Why will you not? You ought to do it." "I will not." "Why?" "Reasons enough." "What can be your reasons?" "Reason first, you are a Virginian, and a Virginian ought to appear at the head of this business. Reason second, I am obnoxious, suspected, and unpopular. You are very much otherwise. Reason third, you can write ten times better than I can." "Well," said Jefferson, "if you are decided, I will do as well as I can." "Very well. When you have drawn it up, we will have a meeting." ^ "Did You Know ... Independence Day Should Actually Be July 2?" (Press release). National Archives and Records Administration. June 1, 2005. Retrieved July 4, 2012. ^ a b McPherson, Second American Revolution, 126. ^ Armitage, David (2007). The Declaration of Independence: A Global History. Cambridge, Massachusetts: Harvard University Press. pp. 113–126. ISBN 0-674-02282-3. ^ a b Jensen, Founding, 682. ^ Boyd, Evolution, 18; Maier, American Scripture, 63. The text of the May 15 Virginia resolution is online Archived June 20, 2008, at the Wayback Machine at Yale Law School's Avalon Project. ^ Jefferson, Thomas (July 4, 1776). "Declaration of Independence. In Congress, July 4, 1776, a Declaration by the Representatives of the United States of America, in General Congress Assembled". World Digital Library. Philadelphia, Pennsylvania. Retrieved July 1, 2013. ^ As quoted in Adams, John (2007). My Dearest Friend: Letters of Abigail and John Adams. Harvard University Press. p. 125. ISBN 978-0-674-02606-3. ^ a b Julian P. Boyd, "The Declaration of Independence: The Mystery of the Lost Original". Pennsylvania Magazine of History and Biography 100, number 4 (October 1976), p. 456. ^ a b c d Lucas, Stephen E. "The Stylistic Artistry of the Declaration of Independence". National Archives and Records Administration. Retrieved July 4, 2012. ^ "Index of Signers by State". ushistory.org – Independence Hall Association in Philadelphia. Retrieved October 12, 2006. ^ TO HENRY LEE – Thomas Jefferson The Works, vol. 12 (Correspondence and Papers 1816–1826; 1905). May 8, 1825. ^ "The Three Greatest Men". Retrieved June 13, 2009. Jefferson identified Bacon, Locke, and Newton as "the three greatest men that have ever lived, without any exception". Their works in the physical and moral sciences were instrumental in Jefferson's education and world view. ^ a b c d The U.S. State Department (1911), The Declaration of Independence, 1776, pp. 10, 11. ^ "TeachAmericanHistory.org: John Hancock" (PDF). Archived from the original (PDF) on May 10, 2013. Retrieved October 6, 2014. ^ a b Maier, American Scripture, 156. ^ "The Declaration of Independence in World Context". Retrieved October 6, 2014. ^ Armitage, Global History, 75. Retrieved October 6, 2014. ^ Jessup, John J. (September 20, 1943). "America and the Future". Life: 105. Retrieved March 9, 2011. ^ Armitage, Global History, 79–80. Retrieved October 6, 2014. ^ Armitage, Global History, 76–77. Retrieved October 6, 2014. ^ a b c "The Declaration of Independence: A History". Charters of Freedom. National Archives and Records Administration. Retrieved July 1, 2011. ^ "Charters of Freedom Re-encasement Project". National Archives and Records Administration. Retrieved July 1, 2011. ^ "Rare copy of United States Declaration of Independence found in Kew". The Daily Telegraph. July 3, 2009. Retrieved July 1, 2011. ^ a b c Dube, Ann Marie (May 1996). "The Declaration of Independence". A Multitude of Amendments, Alterations and Additions: The Writing and Publicizing of the Declaration of Independence, the Articles of Confederation, and the Constitution of the United States. National Park Service. Retrieved July 1, 2011. ^ a b c Boyd, "Lost Original", 446. ^ "Declaration of Independence document found". BBC News. July 4, 2018. ^ a b Maier, American Scripture, 167. ^ Lefebvre, Georges (2005). The Coming of the French Revolution. Princeton UP. p. 212. ^ Billias, George Athan, ed. (2009). American Constitutionalism Heard Round the World, 1776–1989: A Global Perspective. NYU Press. p. 92. ^ Palley, Claire (1966). The Constitutional History and Law of Southern Rhodesia 1888–1965, with Special Reference to Imperial Control (First ed.). Oxford: Clarendon Press. p. 750. OCLC 406157. ^ Hillier, Tim (1998). Sourcebook on Public International Law (First ed.). London & Sydney: Cavendish Publishing. p. 207. ISBN 1-85941-050-2. ^ Gowlland-Debbas, Vera (1990). Collective Responses to Illegal Acts in International Law: United Nations action in the question of Southern Rhodesia (First ed.). Leiden and New York: Martinus Nijhoff Publishers. p. 71. ISBN 0-7923-0811-5. (2) Day, Thomas. Fragment of an original letter on the Slavery of the Negroes, written in the year 1776. London: Printed for John Stockdale (1784). Boston: Re-printed by Garrison and Knapp, at the office of "The Liberator" (1831). p. 10. Retrieved February 26, 2014. If there be an object truly ridiculous in nature, it is an American patriot, signing resolutions of independency with the one hand, and with the other brandishing a whip over his affrighted slaves. At: Internet Archive: The Johns Hopkins University Sheridan Libraries: James Birney Collection of Antislavery Pamphlets. ^ "Abraham Lincoln (1809–1865): Political Debates Between Lincoln and Douglas 1897". Bartleby. p. 415. Retrieved January 26, 2013. ^ "Modern History Sourcebook: Seneca Falls: The Declaration of Sentiments, 1848". Retrieved October 6, 2014. ^ Flood, Alison (September 8, 2011). "Michael Hart, inventor of the ebook, dies aged 64". The Guardian. ^ "Crews finish installing World Trade Center spire". CNN. May 10, 2013. Retrieved July 17, 2013. ^ "Tallest buildings in NY". Skyscraperpage.com. Retrieved June 23, 2012. ^ "Tallest buildings under construction in the world". Skyscraperpage.com. Retrieved June 23, 2012. ^ "1776: The Musical About Us". Pratico. Retrieved May 8, 2018. ^ "John Adams: Independence". Home Box Office, Inc. Retrieved May 8, 2018. ^ "Independence". Fort Wayne Journal Gazette. July 4, 2010. Retrieved February 10, 2018. ^ "National Treasure". rottentomatoes.com. 2004. Retrieved June 10, 2018. Armitage, David. The Declaration Of Independence: A Global History, Cambridge, Massachusetts: Harvard University Press, 2007. ISBN 978-0-674-02282-9. Bailyn, Bernard. The Ideological Origins of the American Revolution. Enlarged edition. Originally published 1967. Harvard University Press, 1992. ISBN 0-674-44302-0. Becker, Carl. The Declaration of Independence: A Study in the History of Political Ideas. 1922.and Google Book Search. Revised edition New York: Vintage Books, 1970. ISBN 0-394-70060-0. Boyd, Julian P. "The Declaration of Independence: The Mystery of the Lost Original". Pennsylvania Magazine of History and Biography 100, number 4 (October 1976), 438–67. Burnett, Edward Cody. The Continental Congress. New York: Norton, 1941. Christie, Ian R. and Benjamin W. Labaree. Empire or Independence, 1760–1776: A British-American Dialogue on the Coming of the American Revolution. New York: Norton, 1976. Dumbauld, Edward. The Declaration of Independence And What It Means Today. Norman: University of Oklahoma Press, 1950. Ellis, Joseph. American Creation: Triumphs and Tragedies at the Founding of the Republic. New York: Knopf, 2007. ISBN 978-0-307-26369-8. Dupont, Christian Y. and Peter S. Onuf, eds. Declaring Independence: The Origins and Influence of America's Founding Document. Revised edition. Charlottesville, Virginia: University of Virginia Library, 2010. ISBN 978-0-9799997-1-0. Ferling, John E. A Leap in the Dark: The Struggle to Create the American Republic. New York: Oxford University Press, 2003. ISBN 0-19-515924-1. Friedenwald, Herbert. The Declaration of Independence: An Interpretation and an Analysis. New York: Macmillan, 1904. Accessed via the Internet Archive. Gustafson, Milton. "Travels of the Charters of Freedom". Prologue Magazine 34, no 4. (Winter 2002). Hamowy, Ronald. "Jefferson and the Scottish Enlightenment: A Critique of Garry Wills's Inventing America: Jefferson's Declaration of Independence". William and Mary Quarterly, 3rd series, 36 (October 1979), 503–23. Jensen, Merrill. The Founding of a Nation: A History of the American Revolution, 1763–1776. New York: Oxford University Press, 1968. Mahoney, D. J. (1986). "Declaration of independence". Society. 24: 46–48. doi:10.1007/BF02695936. Malone, Dumas. Jefferson the Virginian. Volume 1 of Jefferson and His Time. Boston: Little Brown, 1948. Mayer, David (2008). "Declaration of Independence". In Hamowy, Ronald (ed.). The Encyclopedia of Libertarianism. Thousand Oaks, CA: SAGE; Cato Institute. pp. 113–15. doi:10.4135/9781412965811.n72. ISBN 978-1-4129-6580-4. Mayer, Henry. All on Fire: William Lloyd Garrison and the Abolition of Slavery. New York: St. Martin's Press, 1998. ISBN 0-312-18740-8. McDonald, Robert M. S. "Thomas Jefferson's Changing Reputation as Author of the Declaration of Independence: The First Fifty Years". Journal of the Early Republic 19, no. 2 (Summer 1999): 169–95. McPherson, James. Abraham Lincoln and the Second American Revolution. New York: Oxford University Press, 1991. ISBN 0-19-505542-X. Middlekauff, Robert. The Glorious Cause: The American Revolution, 1763–1789. Revised and expanded edition. New York: Oxford University Press, 2005. Norton, Mary Beth, et al., A People and a Nation, Eighth Edition, Boston, Wadsworth, 2010. ISBN 0-547-17558-2. Rakove, Jack N. The Beginnings of National Politics: An Interpretive History of the Continental Congress. New York: Knopf, 1979. ISBN 0-8018-2864-3. Ritz, Wilfred J. "The Authentication of the Engrossed Declaration of Independence on July 4, 1776". Law and History Review 4, no. 1 (Spring 1986): 179–204. Ritz, Wilfred J. "From the Here of Jefferson's Handwritten Rough Draft of the Declaration of Independence to the There of the Printed Dunlap Broadside". Pennsylvania Magazine of History and Biography 116, no. 4 (October 1992): 499–512. Tsesis, Alexander. For Liberty and Equality: The Life and Times of the Declaration of Independence (Oxford University Press; 2012) 397 pages; explores the impact on American politics, law, and society since its drafting. Warren, Charles. "Fourth of July Myths". The William and Mary Quarterly, Third Series, vol. 2, no. 3 (July 1945): 238–72. JSTOR 1921451. United States Department of State, "The Declaration of Independence, 1776, 1911. Wills, Garry. Inventing America: Jefferson's Declaration of Independence. Garden City, New York: Doubleday, 1978. ISBN 0-385-08976-7. Wills, Garry. Lincoln at Gettysburg: The Words That Rewrote America. New York: Simon & Schuster, 1992. ISBN 0-671-76956-1. Wyatt-Brown, Bertram. Lewis Tappan and the Evangelical War Against Slavery. Cleveland: Press of Case Western Reserve University, 1969. ISBN 0-8295-0146-0. Arthur Middleton (June 26, 1742 – January 1, 1787), of Charleston, South Carolina, was a signatory of the United States Declaration of Independence. His parents were Henry Middleton and Mary Baker Williams, both of English descent. He was educated in Britain, at Harrow School, Westminster School, and Trinity Hall, Cambridge. He studied law at the Middle Temple and traveled extensively in Europe where his taste in literature, music, and art was developed and refined. In 1764, Arthur and his bride Mary Izard settled at Middleton Place. Keenly interested in Carolina, Middleton was a more radical thinker than his father, Henry Middleton. He was a leader of the American Party in Carolina and one of the boldest members of the Council of Safety and its Secret Committee. In 1776, Arthur was elected to succeed his father in the Continental Congress and subsequently was a signer of the United States Declaration of Independence. Also in 1776, he and William Henry Drayton designed the Great Seal of South Carolina. Despite the time he spent in England, his attitude toward Loyalists was said to be ruthless. During the American Revolutionary War, Middleton served in the defense of Charleston. After the city's fall to the British in 1780, he was sent as a prisoner of war to St. Augustine, Florida (along with Edward Rutledge and Thomas Heyward Jr.), until exchanged in July the following year. Middleton died on January 1, 1787 at the age of 44 and was buried in the family tomb in the Gardens at Middleton Place. The death notice from the State Gazette of South-Carolina (SC), Jan. 4, 1787, described him as a "tender husband and parent, humane master, steady unshaken patriot, the gentleman, and the scholar." The plantation then passed to Henry, his eldest son, later Governor of South Carolina, U.S. Representative and Minister to Russia. Arthur Middleton was also an ancestor of actor Charles B. Middleton, who played Ming the Merciless in the Flash Gordon movies of the 1930s. Arthur Middleton's son-in-law was Congressman Daniel Elliott Huger who was the grandfather-in-law of Confederate General Arthur Middleton Manigault who was also a descendant of Henry Middleton. Arthur Middleton's sister, Susannah Middleton, was the great-great-grandmother of Baldur von Schirach, onetime leader of the Hitler Youth and later Governor ("Gauleiter" or "Reichsstatthalter") of the Reichsgau Vienna, who was convicted of "crimes against humanity" at the Nuremberg Trials, through Baldur Von Schirach's mother Emma Middleton Lynah Tillou (1872–1944). The United States Navy ship, USS Arthur Middleton (AP-55/APA-25), was named for him. Button Gwinnett (1735 – May 19, 1777) was a British-born American founding father who, as a representative of Georgia to the Continental Congress, was one of the signatories (first signature on the left) on the United States Declaration of Independence. He was also, briefly, the provisional president of Georgia in 1777, and Gwinnett County (now a major suburb of metropolitan Atlanta) was named for him. Gwinnett was killed in a duel by rival Lachlan McIntosh following a dispute after a failed invasion of East Florida. Francis Lewis (March 21, 1713 – December 31, 1802) was a signer of the United States Declaration of Independence as a representative of New York. James Smith (September 17, 1719 – July 11, 1806), was an American lawyer and a signer to the United States Declaration of Independence as a representative of Pennsylvania. He was born in the province of Ulster, Ireland; his family immigrated to Chester County, Pennsylvania, in 1729. Smith attended the Philadelphia Academy. He studied law at the office of his brother George and was admitted to the bar in Pennsylvania, initially practicing near Shippensburg, and later near York. He became captain of the militia there. He was appointed to the provincial convention in Philadelphia in 1775, to the state constitutional convention in 1776, and was elected to the Continental Congress. He was reelected to Congress in 1785 but declined to attend because of his advanced age. Smith died on July 11, 1806 and is buried in York, Pennsylvania, First Presbyterian Churchyard. The University of Delaware has a dorm on its North Campus bearing his name. John Morton (1725 – April 1, 1777) was a farmer, surveyor, and jurist from the Province of Pennsylvania and a Founding Father of the United States. As a delegate to the Continental Congress during the American Revolution, he was a signatory to the Continental Association and the United States Declaration of Independence. Morton provided the swing vote that allowed Pennsylvania to vote in favor of the United States Declaration of Independence. Morton chaired the committee that wrote the Articles of Confederation. John Penn (May 17, 1741 – September 14, 1788) was a signer of both the United States Declaration of Independence and the Articles of Confederation as a representative of North Carolina. "Life, Liberty and the pursuit of Happiness" is a well-known phrase in the United States Declaration of Independence. The phrase gives three examples of the "unalienable rights" which the Declaration says have been given to all humans by their creator, and which governments are created to protect. The Memorial to the 56 Signers of the Declaration of Independence is a memorial depicting the signatures of the original 56 signatories to the United States Declaration of Independence. It is located in the Constitution Gardens on the National Mall in Washington, D.C. The memorial is accessible to the public by crossing a wooden bridge onto a small island set in the lake between Constitution Avenue and the Reflecting Pool, not far from the Vietnam Veterans Memorial. Revolutionary War Door is an artwork by American sculptor Thomas Crawford, located on the United States Capitol House of Representatives wing east front in Washington, D.C., United States. This sculptured door was surveyed in 1993 as part of the Smithsonian's Save Outdoor Sculpture! program. Richard Henry Lee (January 20, 1732 – June 19, 1794) was an American statesman and Founding Father from Virginia best known for the Lee Resolution, the motion in the Second Continental Congress calling for the colonies' independence from Great Britain. He was a signatory to the Articles of Confederation, and his "resolution for independency" of June 1776 led to the United States Declaration of Independence, which Lee signed. He also served a one-year term as the President of the Congress of the Confederation, and was a United States Senator from Virginia from 1789 to 1792, serving during part of that time as the second President pro tempore of the upper house. He was a member of the Lee family, a historically influential family in Virginia politics. The Second Continental Congress was a convention of delegates from the Thirteen Colonies that started meeting in the spring of 1775 in Philadelphia, Pennsylvania. It succeeded the First Continental Congress, which met in Philadelphia between September 5, 1774, and October 26, 1774. The Second Congress managed the Colonial war effort and moved incrementally towards independence. It eventually adopted the Lee Resolution which established the new country on July 2, 1776, and it agreed to the United States Declaration of Independence on July 4, 1776. The Congress acted as the de facto national government of the United States by raising armies, directing strategy, appointing diplomats, and making formal treaties such as the Olive Branch Petition.The Second Continental Congress came together on May 11, 1775, effectively reconvening the First Continental Congress. Many of the 56 delegates who attended the first meeting were in attendance at the second, and the delegates appointed the same president (Peyton Randolph) and secretary (Charles Thomson). Notable new arrivals included Benjamin Franklin of Pennsylvania and John Hancock of Massachusetts. Within two weeks, Randolph was summoned back to Virginia to preside over the House of Burgesses; he was replaced in the Virginia delegation by Thomas Jefferson, who arrived several weeks later. Henry Middleton was elected as president to replace Randolph, but he declined. Hancock was elected president on May 24.Delegates from twelve colonies were represented when the Second Continental Congress convened. Georgia had not participated in the First Continental Congress and did not initially send delegates to the Second. Even so, the people of St. John's Parish (present day Liberty County) sent Lyman Hall to the gathering on their behalf. He participated in debates but did not vote, as he did not represent the entire colony. That changed after July 1775, when a Provincial Congress decided to send delegates to the Continental Congress and to adopt a ban on trade with Britain. One year later, Hall and two other Georgia delegates signed the Declaration of Independence. The signing of the United States Declaration of Independence occurred primarily on August 2, 1776 at the Pennsylvania State House, Independence Hall in Philadelphia, Pennsylvania. The 56 delegates to the Second Continental Congress represented the 13 former colonies which had declared themselves the "United States of America," and they endorsed the Declaration of Independence which the Congress had approved on July 4, 1776. The Declaration proclaimed that the former Thirteen Colonies then at war with Great Britain were now a sovereign, independent nation and thus no longer a part of the British Empire. The signers’ names are grouped by state, with the exception of President of the Continental Congress John Hancock; the states are arranged geographically from north to south. The final draft of the Declaration was approved by the Continental Congress on July 4, although the date of its signing has long been disputed. Most historians have concluded that it was signed on August 2, 1776, nearly a month after its adoption, and not on July 4 as is commonly believed. Thomas Heyward Jr. (July 28, 1746 – March 6, 1809) was a signer of the United States Declaration of Independence and of the Articles of Confederation as a representative of South Carolina. He was born in St. Luke's Parish (now known as Jasper County), South Carolina and educated at home, then traveled to England to study law where he was a member of the Honourable Society of the Middle Temple. He was elected to the Continental Congress in 1775 and signed the Declaration of Independence in 1776. Heyward returned to South Carolina in 1778 to serve as a judge. In command of a militia force, he was taken prisoner by the British during the siege of Charleston. He continued to serve as a judge after the war, retiring from the bench in 1798. He is buried at Old House Plantation near Ridgeland, Jasper County, South Carolina. It was added to the National Register of Historic Places in 1997.Located in Ridgeland, South Carolina, there is a school named after him called Thomas Heyward Academy. Their nickname is the rebels and colors are maroon and white. Thomas Stone (1743 – October 5, 1787) was an American planter and lawyer who signed the United States Declaration of Independence as a delegate for Maryland. He later worked on the committee that formed the Articles of Confederation in 1777. He acted as President of Congress for a short time in 1784. The Virginia Declaration of Rights is a document drafted in 1776 to proclaim the inherent rights of men, including the right to reform or abolish "inadequate" government. It influenced a number of later documents, including the United States Declaration of Independence (1776) and the United States Bill of Rights (1789). William Ellery (December 22, 1727 – February 15, 1820) was a signer of the United States Declaration of Independence as a representative of Rhode Island. In 1764, the Baptists consulted with Ellery and Congregationalist Reverend Ezra Stiles on writing a charter for the college that became Brown University. Ellery and Stiles attempted to give control of the college to the Congregationalists, but the Baptists withdrew the petition until it was rewritten to assure Baptist control. Neither Ellery nor Stiles accepted appointment to the reserved Congregationalist seats on the board of trustees. William Floyd (December 17, 1734 – August 4, 1821) was an American politician from New York, and a signer of the United States Declaration of Independence. William Whipple Jr. (January 25, 1731 NS (January 14, 1730 OS – November 28, 1785) was a signatory of the United States Declaration of Independence as a representative of New Hampshire and a member of the Continental Congress from 1776 through 1779. He worked as both a ship's captain and a merchant, and he studied in college to become a judge. He died of heart complications in 1785, aged 55.